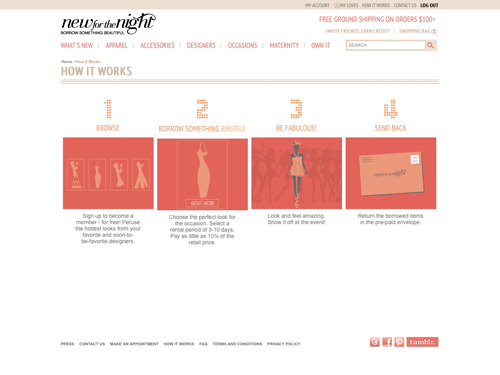 NewForTheNight.com is a new luxury designer dress rental website that makes it easy to Borrow Something Beautiful.™ "Our experience creating eCommerce websites for fashion designers and high-end fashion boutiques made this project a perfect fit for us," says Tina Zulu, Founder and Creative Chieftess of Zulu Creative. “[Zulu Creative] far exceeded our expectations--always helping turn business decisions into reality, says Brittany Sakowitz, Creator and owner of New for the Night." Zulu Creative is proud to announce the launch of New for the Night, http://www.NewForTheNight.com, the designer dress rental destination that makes it easy to Borrow Something Beautiful.™ Fashionistas can join the site for free, peruse the latest looks from established and emerging designers and choose their perfect dress for all special occasions. For up to 90% off the retail price, members can rent designer apparel from Rebecca Taylor, Tibi, Halston Heritage and more for a period of 3-10 days. Orders of $100 and more qualify for free ground shipping. In addition, accessories such as evening bags and jewelry are available for purchase to complete an amazing look. Based in Houston, Texas, New for the Night also operates a River Oaks showroom where members can make an appointment to try on and pick up dresses with help from in-store stylists. 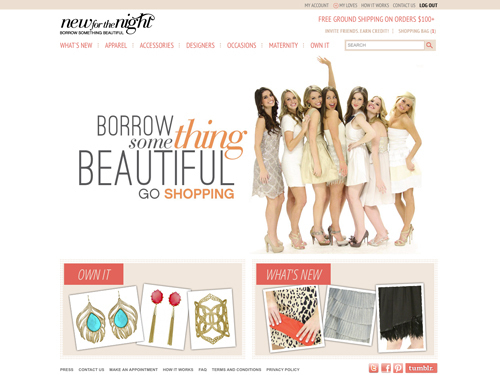 “We chose and trusted Zulu Creative with NewForTheNight.com because we wanted a team that had the capability and talent to design, implement and program our concept,” says Brittany Sakowitz, Creator and Owner of New for the Night. “They far exceeded our expectations--always helping turn business decisions into reality, working long hours and helping drive the project to launch. We could not be happier with the product of our collective efforts and are so proud to introduce the site." Shop by Occasion - Search for Black Tie, Little Black Dress, Baby Shower, etc. Social media sharing for Pinterest, Facebook, Twitter and more. A Midtown Houston-based niche marketing and brand development agency, Zulu Creative helps style-conscious businesses in the arts, entertainment, fashion, hospitality and music industries look their best. Founded by Tina and Josh Zulu, the agency specializes in creating memorable experiences and making an impact through innovative marketing. Clients who choose Zulu Creative enjoy a cutting-edge image and unique opportunities and synergy that come through the agency’s network of beneficial relationships. For more information, visit http://www.zulucreative.com.